Long-time coastal Texas fly-fishing guide Chuck Naiser takes Mike Leggett on a ride through the Aransas National Wildlife Refuge and back into history. 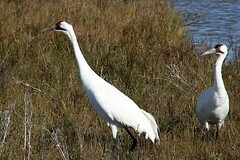 A nice piece on the history of the endangered whooping crane and efforts to save them, including putting their eggs in sandhill crane nests. “Each fall, either in pairs or with chicks, the cranes break away from the Canadian wilderness and fly 2,200 miles south-southeast over Moose Jaw, Saskatchewan, the Dakotas, Nebraska, Kansas and Oklahoma. They end the gauntlet of power lines, wind turbines and former intermediate feeding grounds fragmented by humans by flying over Fort Worth, down along the Colorado Rive drainage, and settling in salt marshes along the middle Texas coast.” In the Austin, Texas Statesman.